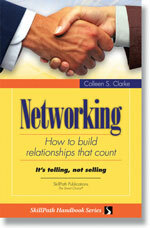 It is with great pleasure that I am able to introduce you to a revised edition of my old networking book. Networking How to Build Relationships That Count is hot off the press and guaranteed to give you a positive and exciting perspective on networking. This book removes the fear that many people have about reaching out and making connections, often with perfect strangers in strange environments. It is a “how to book”: how to engage people, what to say to set up advice call meetings, scripts to recite when at functions or in networking meetings,the importance of internal networking and increasing ones visibility. …then this is a book you can use right now. Colleen Clarke learned her networking skills by earning them. She got where she wanted to be and got what she wanted to have by practicing these techniques long before anyone thought to call it “networking”. In her fresh approach to an age-old challenge, the author shows you that no matter what you’re looking for, you probably can find it through networking. Whether or not you consider yourself an experienced networker, this book will give you different insights and practical advice, presented in simple, clear terms. You’ll come away with the confidence to begin networking for the first time, or to improve the skills you’ve already been using. It is with great pleasure that I am able to introduce you to a revised edition of my old networking book. Networking How to Build Relationships That Count is guaranteed to give you a positive, exciting and doable perspective on networking. This book removes the fear that many people have about reaching out and making connections, often with perfect strangers in strange environments. It is a “how to book”: how to engage people, what to say to set up advice call meetings, scripts to recite when at functions or in networking meetings,the importance of internal networking and increasing ones visibility. I don’t have any contacts. I don’t like having other people solve my problems. It will appear as if I’m begging. I don’t like to use people. I will owe too many favors. I feel uncomfortable networking and I lack confidence. No one can help me, why should they? No one understands my real needs. There’s an answer for each and every one of these so-called barriers (excuses! 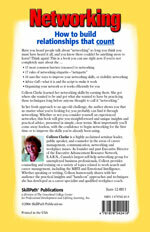 ), along with a trove of other useful and inspiring information in Networking How to Build Relationships. It is with great pleasure that I announce the publication of the book The Power of Mentorship and my chapter “If You’re Not Appearing, You Are Disappearing” as a contributing author. 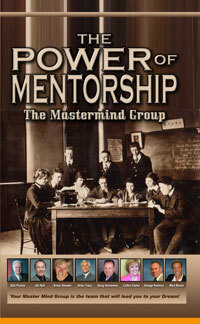 It is an honor to be sharing the pages with my mentors Brian Tracy, Bob Proctor and Zig Ziglar! This chapter extols the importance of increasing your internal visibility within your organization to build a stronger people and resource network. The most important emotional intelligent skill necessary for employment sustainability in the workplace today is your ability to build and maintain interpersonal relationships. Without the backing of your colleagues and superiors, you are just another number, another face in the sea of ambiguity. Increasing your area of influence allows opportunities to find you. You will learn of 19 ways you can heighten your visibility through a strong internal network. Order this book for your own professional development or as gifts to clients or as an employee reward. In this e-book, you’ll find work search and job retention strategies along with insightful comments on hundreds of aspects of the working relationship. This book is a “must read” and offers guidance on almost every facet of employment. In today’s competitive job market, a little career savvy goes a long way. To help you stay on top of your game, we talked to veteran career specialist and corporate trainer Colleen Clarke. She’s also author of the new e-book, How to Get a Job and Keep It ($15; colleenclarke.com), a compilation of articles written by the former Metro career columnist. Here are her top tips for getting and keeping the job. Be ready mentally and physically. “You need to have a feeling of confidence and hope, and look like the pro you are,” says Clarke. Have an impeccable resumé, and create an organized system for tracking cover letters, phone calls, follow-ups and contacts. Set daily goals. Maintain a work-life balance with a five-hour daily job search. Network. That means more than just e-meet ’n’ greets. Get out there and volunteer, too. Watch and observe what happens in your company for the first six weeks after you’re hired. Find out about people previously in your position. Give more than you get. “Come in 10 minutes early and offer to help your colleagues,” says Clarke. Find a mentor who can answer your questions and act as an orientation guru. Practice good communication. That involves listening, working well with others, and building trust.